Well, my mast is repaired now, I've done a couple things Revo suggested, and I'm going to try my luck at sailing again this Sunday. Winds are forecasted to be similar, so this should be a good test. Video and report to follow. Looking forward to it. You are obviously enjoying the sailing. When the winds get high (+10knots) furling is important. Once the mast starts to wobble around uncontrollably it's time to furl. I sail my Adventure a lot and have never capsized it ...though I've come close on exactly the same point of sail that you capsized on. It's where the kayaks are the least stable and I did capsize my old Oasis in the same conditions. I don't use stabilizers (even though I have a set of Sidekicks) but I do use the Daggerboard on all points of sail. It has saved me from many a capsize as it slows heeling and gives you time to react. If you are serious about sailing a Db is a must. You can add one to your Revo by adapting the drivewell cassette. I reckon Hobie should be producing a drivewell cassette that takes the Adventure Db so that all the miragedrive kayaks can sail as well as the Adventure! Stringy, I've researched the steps for making a dagger board in exactly the same fashion, but so far it seems like I need to pedal too often to completely abandon the mirage drive on a sailing trip. We shall see. The dagger board idea remains in the back of my mind as an attractive upgrade to the sailing experience. Btw: what would be a good length db for a revo11? 18" maybe? I've become a bit of a sailing purist these days so if I have to pedal then I won't sail. I don't like pedalling while heeled over as my back gets sore. The mirage drive does add drag and I really enjoy just plain sailing without the drive in. It tacks much better. 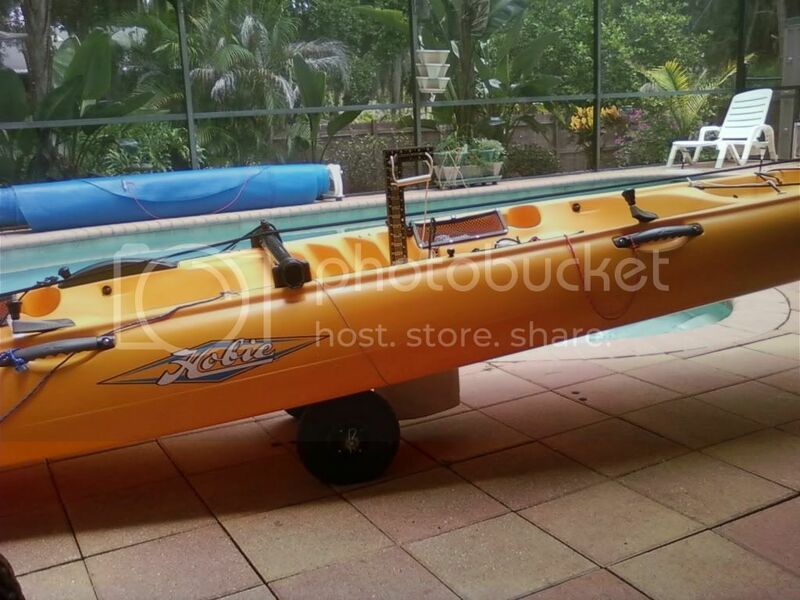 Re the daggerboard I have only used the Hobie Adventure db. It's perfect for the job and I wouldn't be bothered trying to make one. The later plastic board is much more durable than the original fibreglass boards. You really want the amas. I thought I could get by without them. But after a series of unfortunate events, including a swim in the ocean in nippy water (think February), I decided I needed them. Previously I was under the impression I could hold onto the sail with my hand and if the wind gusts sufficiently release the sail manually. After my near drowning in February, I purchased the 185.00 sidekicks. They have been great. I really haven't done much sailing over the winter, but they've kept the boat really stable to the point I'm nervous now without them. I often go out in the ocean, with only the inflatable amas and can swing around sideways and back without any fear. In the late spring and summer, I plan to go sailing and trolling in the ocean for big game. By the way, they also make wooden amas like real sailboats and chesapeak light craft, but they cost around 350.00 and you will need to buy the kit and make them your self plus figure out how to attach them. Best of luck to you. I would not go as far as to say you need the amas but they sure do add some added confidence on blustery days. I had only sailed on the lake behind my house prior to the trip to the Bay with jcanracer. The narrows between cul de sacs on my lake created nasty gusts that sent me over a few times so I got used to using the amas. Out in the Bay the winds are much more consistent and most likely could have done without them. The high setting kept them out of the water unless I really keeled over. I have the turbo fins which act as a daggerboard. I keep them straight down while sailing. I cannot wait to get out there again. My HD Action cam will be with me. I would rather be kayaking and think about work than to be at work thinking about kayaking. A Thrill Ride is being dragged around in your kayak for 40 minutes by an extremely large fish. If you don't want to put sidekicks on, one thing we did to make it easier to sail in higher winds was to add a removable weighted keel. The weighted keels are actually pretty simple, they just lower the center of gravity enough so if a gust in high winds comes up it give you more time to react, as I'm sure you have found out the hard way, tipping over typically happens in an instant and you have no time to react, with the keel weight the boat is more forgiving, and it would take quite a bit more to upset you, actually with me it's usually powerboat wakes that get me more so than wind unless the gusts are very high (then its either/or both). 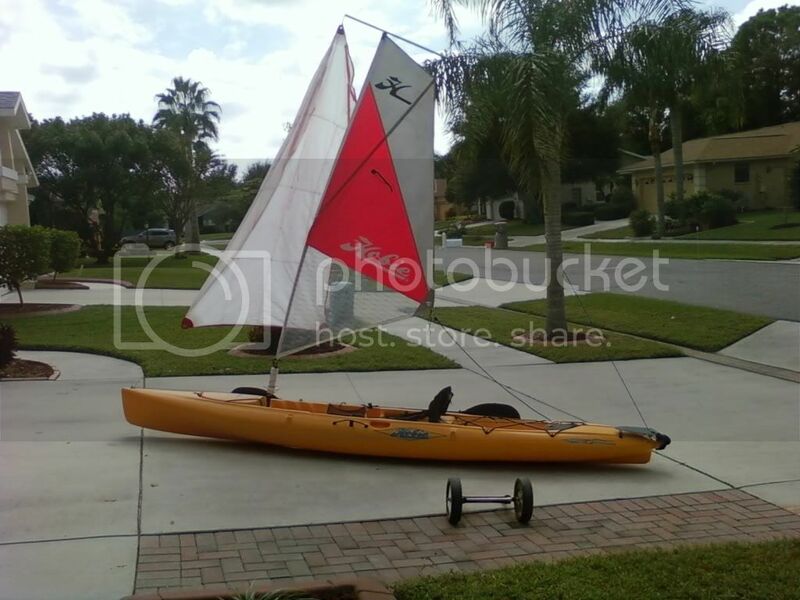 Here is a pic of one of our Revo's with a jib/spinnaker attached, we had a detachable weighted keel that we would put on when the winds were expected to be high, actually if they weren't too extreme we would just lay it in the center in the front hatch between a couple dry bags or something to keep it from rolling around inside the hull and go out for the day. If the winds picked up and we really needed it we would string it under the hull (you can do it out on the water (but don't drop it ( LOL)). Basically I just stole some weights from my wifes scuba weight belt (shhh I didn't tell her). They come in little bags filled with lead beads (can be purchased at any scuba shop), each bag is marked how much weight, just buy enough to total about 25-30 lbs ( I'm not sure what a revo 11 would need, I'm guessing between 20 and 25 lbs)). You then just take a 3 ft piece of 2" PVC tubing glue a cap on one end, then pour the beads into one end, Once you get to your desired weight, you just cut off the excess pipe and glue a cap onto the other end. That's all that is needed, since the tube is already the most efficient hydrodynamic shape (a torpedo shape) your good to go. To attached to the boat I just used spectra rudder line (available from Hobie for around $.30 per foot) using cinch knots I wrapped 3 lines around the tube (like a noose knot, the end caps prevent the string from falling off the ends) then hung the weight so it was around 10 inches below the boat. The front line went up thru the back of the mirage hole and looped onto the cleat near the mirage drive (I just had a cinch knot forming a loop and hung it on the cleat. The back two lines we also just loops that hung on the cleats near the back of the boat (the ones that hold the gear bungy cord over the deck). Same thing they were just cinch loops that you just pull over the post and let the whole torpedo just dangle under the boat. If you beach the boat you don't need to worry about the keel weight, it simply just pushes out of the way (your not going to be able to hurt it). Actually you can have a couple cinch loops on the front line so you can have the weight either shallower or deeper if needed is you want to get fancy. Don't worry about the mirage drive touching the front string, the string will get out of the way and shouldn't interfere with the mirage drive at all. We only used ours when we really needed it, and just left it at home or stored it in the hull when not being used because there is a little drag from the torpedo but it's not as much as sidekicks in the water would be. I've made one of these for just about all my sailing kayaks over the years, and makes coming in the surf, or working around a lot of powerboat wakes, and gusty wind conditions a lot safer. 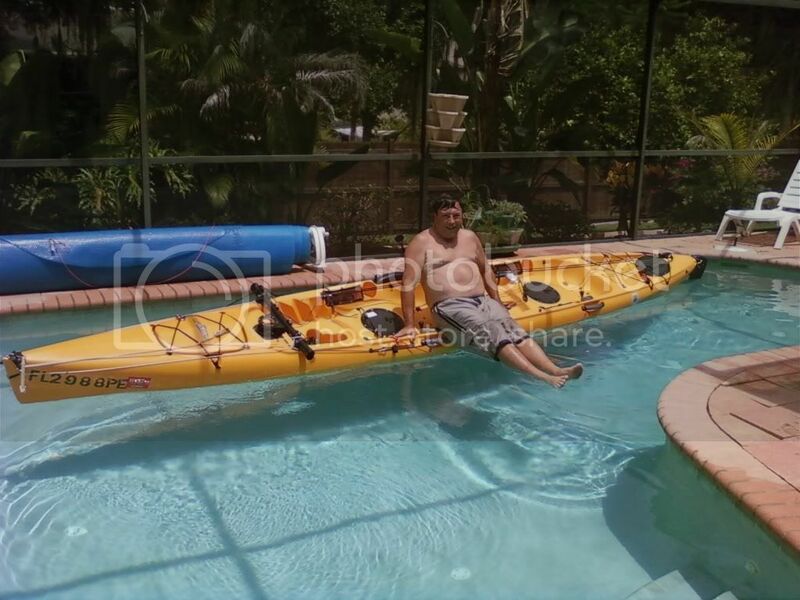 To test everything out we just jumped in our pool and tested out different combinations of weights and depths, and also practiced re-boarding the boat until we had that down pat as well (the weighted keel makes it much easier to re-board the kayak from the water. Actually the keel weight because it is dangling on string, makes it much easier to right the boat when it is capsized, because the weight dangles down one side and make it much easier to right the boat in rough water, also it prevents the boat from going over a second time (like you did) giving you time to get your sail and gear organized before taking off again. Of course if the conditions are light, we just leave the darn thing at home, or stored inside the hull (it still works inside the hull some). 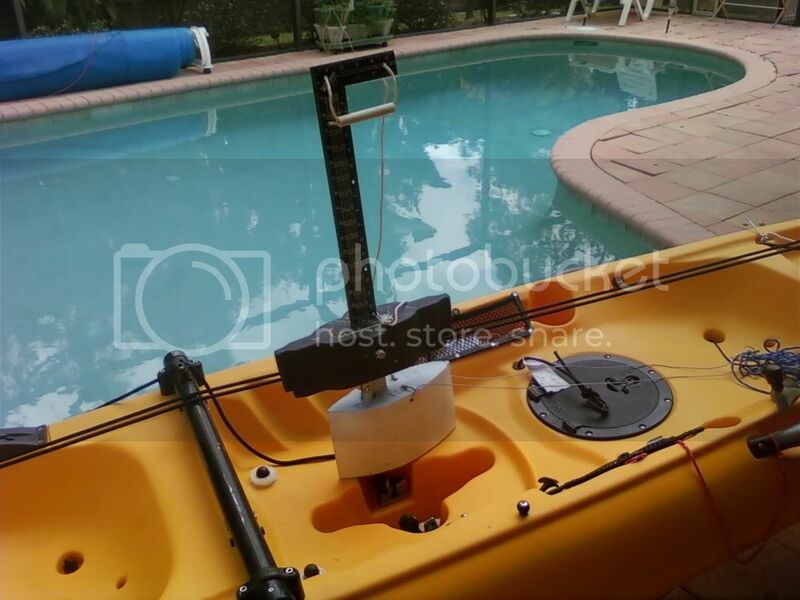 Here is a pic of one of my TI's (in kayak mode with no AMA's) I have a 50 lb keel weight on this boat (because the boat is much larger). That sail is 33 sq ft and is around 17-18 ft tall above the water, I can sail with no major issues in light to moderate conditions with that sail, but it gets a little hairy in winds over 10 mph (basically you can count on going over once in a while because the sail is too tall). The sail serves double duty, and I also use it as a jib on my TI with in sailing mode. Well, just to follow up, I did go to the bay again yesterday. I tried to improve the furler's performance by (a) changing the line to a slightly thicker rope that did not slip as easily and (b) using Revo's suggestions to wrap the bungie around the mast before hooking it on. Both a & b worked well in light breeze, but I needed more twists in my sail bungie to make it continue to perform better in higher winds; I wonder if shortening it would be too drastic? The wind was coming off the NW (mainland) at 10-15 knots and was inconsistent. Much like Revo's experience sailing his residential lake, I had gusts and lulls coming at me so I tried to half furl the sail. The new, longer, mainsheet that I put on was helpful so I could let the wind out of the sail without totally letting go of it. Unfortunately I had flashbacks of last week's swimming lesson so I packed it up after only 10 minutes, I did not trust that inconsistent wind. But hey, I didn't fall in this time! BTW I am loving all the ideas and helpful tips, definitely a fun direction for this thread. Bob I think I read your posts a while back regarding the hanging ballast tube before and I think its pretty brilliant. Stringy's daggerboard advice is also tempting... So why not both? Has anyone ever done a daggerboard/keel with a weight at its lowest point? I think its either called a "weighted keel" or "keel with ballast bulb". I've glimpsed it on some racing sailboats and it looked like a weird but cool idea to me. I guess the problem is that the shape would have to be small enough to fit through the mirage drive hole or else put in place before going out on the water. Actually that's what I use on my TI as shown in the pictures. It's what they call a swinging keel. It also works as a daggerboard offering some lateral resistance. However these are more complex, and more work to use, and at least with mine, it uses up one of my mirage drive slots (the TI has two mirage drives), and I would never want to go out without my mirage drive installed and working as it makes kayak sailing way easier and more stable, also with your mirage drive fins pointed down, the fins are your dagger board, so there is no need to add a second dagger board. 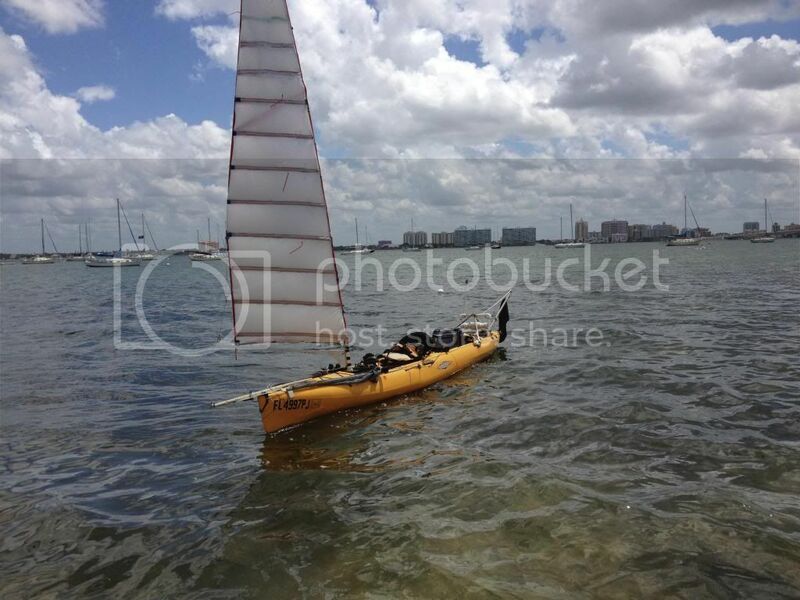 Another big deal is when kayak sailing if you aren't pedaling, you can't point into the wind anywhere as close as you can when sailing upwind if you pedal lightly while sailing. Plus it's near impossible to tack when kayak sailing without the mirage drive. Here is a pick of mine, because the TI is so big, this one is 50 lbs, fortunately I have carry handles on it (LOL). When in the up position I can still use the scupper cart. It's actually very simple, I just used two empty cereal boxes and taped them together to form the taper shape, I then mixed up some polyester resin (bondo fiberglass resin, (it's really cheap)) and poured it into the cereal box mold, I then just poured the lead beads into the mold, I buried a piece of pipe into the center for something to bolt the upright blade to. For the blade I just used an old carpenters square, they are typically made of high carbon or stainless steel, and are flexible from side to side. I took one of my mirage drive plugs and filled it with foam and bondo body putty so the carpenters square can slide easily up and down. I also replaced the plastic pegs that hold into the mirage slot with a 1/2" dia steel or aluminum rod, and just filled around it with foam and body putty. I drilled several holes in the side of the carpenters square so I could adjust the depth to different depths as desired, I just placed a pin into the correct hole to set the depth, or all the way up for transporting. I purposely made the mirage drive plug weak enough so it simply gives away and breaks if I hit the bottom or something submerged. Before coming to shore, I just pull the mirage plug out. I have spectra (rudder line) attached to each side of the weight (these actually support the majority of the weight). When underway if I need to swing the keel over to one side (up to about 15 inches off center) I just pull one of the strings tighter, this levels out the boat (just like the most modern racing monohulls). Honestly it doesn't work any better than the torpedo, and actually has a little more drag. I even tried mounting the control strings further back so when tipping the weight would turn like a rudder to help keep the keel submerged (the boat is not moving fast enough to be of much use steering the weight like a rudder, but swinging from side to side actually works pretty well, and helps balance the boat (unless of course you tack and forget about adjusting the weight over to the other side, it actually tips you over (LOL, done that)). To be perfectly honest I hardly ever use the darn thing, it's just too complex and too much bother to mess with. And like I said earlier you definitely don't want to leave your mirage drive out on a single seater kayak when kayak sailing, it would be like driving your car without the engine. Personally keeping everything as simple as possible, and only using when needed seems to work best, if things get to complex or too long to rig you end up not using them. That's why I think the torpedo is the simplest of all solutions, even simpler and cheaper than the sidekicks, and actually works a little better IMO. I needed more twists in my sail bungee to make it continue to perform better in higher winds; I wonder if shortening it would be too drastic? I tie a simple knot in the bungee. It shortens it up just about perfectly for a tight fit on the furler. If you want to use it later on a non-furler application, just untie the knot and you have your original specs. Stringy's daggerboard advice is also tempting... So why not both? I have a lead weighted drivewell plug that I occasionally use for ballast for the Oasis. Filled with lead shot (you can buy it by the bag at some gun supply stores) and stabilized in an epoxy slurry (actually some leftover floor leveler) it weighs 24#. Coincidentally, since it sits so low in the boat, it adds a significant stability element when sailing. If you were to combine this concept with stringy's daggerboard you would add the benefits of both with minimal drag. With only one drivewell though you would be purely sailing without your Mirage Drive. Like Bob, I like having the Drive available at all times. BTW, in lighter winds, active pedaling while sailing not only speeds you up, but works just as well as having the fins straight down for minimizing side slip. :... what the hell are those little dangly things mounted on the face (front) of the sail? For Red's benefit, perhaps we should just call them pasties. The video provided by Dr.SteelheadCatcher applies specifically when you're "pinching" (getting the maximum sailing angle upwind), but the concept applies for any upwind or crosswind tacks as well. The procedure is a little different though for other upwind points of sail. If you want to maintain heading, you simply adjust the sail so that both telltales are flying (not stalled) for optimal sail performance. Since wind direction and velocity are always changing somewhat, active management of the sail gives the best results. Telltails don't work like this for downwind points of sail. All very good points. I feel silly for being the new guy who wants to re-invent the wheel when Hobie has probably thought this all out already. With only one drivewell at my disposal, it wouldn't make sense to get fancy with a weighted keel unless I was out in winds that are... inadvisable. I've decided to save up some discretionary funds for an Ama kit. Meanwhile, if I can find the lead around the house, I'll try the suspended ballast tube [ala fusioneng]. Another good source of lead is tire shops. Although not as convenient to use as dive weights or shot, it's readily available everywhere and the price is usually very reasonable. The white cylinder in the pic above is full of melted used wheel weights solidified in empty tin cans. Lead is easy to melt and cast. You can use whatever is handy- single serving juice containers, thin-wall pipe, etc., sleeve it into your PVC keel, fill any gaps with any liquid that will set up, and seal it. You could just throw the weights in, but you don't get near the density and efficiency as having a solid fill. We live in one of the biggest dive destinations and plenty of dive shops around to get the lead. The Diver's Direct next door to Bass Pro Shop will have it. Most all dive weights now are the mesh bags with lead shot. Just buy the bags totaling the weight you want. You won't have any trouble finding them around here.